Mario Buatta, the 78-year-old iconic New York designer known for his love of chintz and dog portraits as well as his corny jokes and puns, finally compiled his amusing stories, personal photos and best projects in a 432-page tome, Mario Buatta: Fifty Years of American Interior Decoration, with design historian Emily Evans Eerdmans. The book features homes he decorated for Mariah Carey and Barbara Walters, as well as homes in Miami, Delray Beach and the principal residence of Hilary and Wilbur Ross on Palm Beach. Why did you finally decide to do a book? Publishers kept asking me to do a book. Rizzoli hounded me for a couple of years and I finally gave in. Two years ago I went to a meeting and brought a sketch of what I wanted to put on the cover – a photograph and blue leather. I wanted it to look like a scrapbook and be filled with pictures and very little writing. I hate endless pages of writing. People just look at the pictures in design books. I also wanted it to have special things from me and my family and cartoons from The New Yorker. The book sounds like you. Are the stories true? It’s all true. My mother did vacuum herself into bed and out of the house so we could see footprints if anyone had been there when we were gone. Who influenced your style the most? Aunt Mary and John Fowler. My parents had art deco. Aunt Mary had Chickendale [Chippendale], Hecklewhite [Hepplewhite] and Chinooserie [Chinosierie] antiques. I was always at her house and she took me shopping to antiques shops. 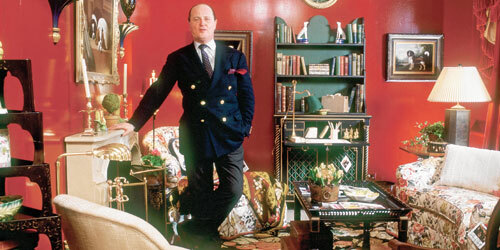 I didn’t know who John Fowler was, but I saw the yellow room in Nancy Lancaster’s home and went crazy. It was in the days before computers and I had to go to Condé Nast in London to pore over his work and study it. Do you change your style for South Florida? What goes through my head is what suits the house, the architecture and what the client wants. I went to architecture school for nine weeks and hated it. I learned by looking at photographs and magazines. I haven’t had an assistant in 18 years. The last one I beat to death with a bolt of chintz. You are as much an entertainer as a designer. Why? A. When you are with a client and suddenly things are at a standstill. I tell a joke. It breaks the spell. They start laughing. It’s decorating, not brain surgery. Your book is larger than those devoted to Sister Parish and Billy Baldwin and will make you immortal. How do you feel about this? I feel immortal now. It’s a Buattapedia. Rizzoli gave me an extra 100 pages at the end. The book would have been sad without it. It weighs 7 pounds and gives me a hernia.